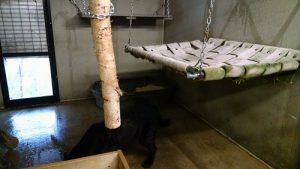 What’s a rescued leopard supposed to do on a cold Minnesota winter day? 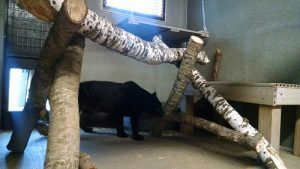 Play on his indoor jungle gym, or curl up in a cozy hammock inside where it’s toasty warm! 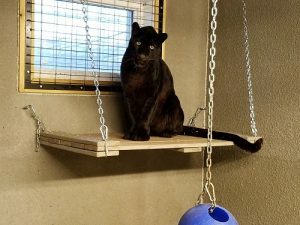 Even though our warm weather cats like leopard Shazam enjoy playing outdoors in the snow, we also think it’s important to provide our cats indoor, heated buildings with plenty of things to do and warm places to sleep. We believe we owe it to our rescue residents to provide them choices. They get to choose what path to walk down, where to sleep and what activities they enjoy. Your support brings happiness to so many like Shazam who was once an exhibit animal. But now, because of YOU, they’ll spend the rest of their lives wild at heart at their forever home – The Wildcat Sanctuary. With your generous help, they’ll all stay warm this winter! As most of you know, it gets cold in Minnesota! Some winter days here are well below zero and it’s our job to keep all our cats, like Shazam, warm and safe from the elements. This season, you can give a gift that’s both heartwarming and habitat warming. Your help allows cats like Shazam to live wild at heart. He loves to play with his hanging toys both inside and outside. And he enjoys running along his shared habitat wall with tigress Nikita. Because of YOU, he enjoys an open space natural habitat with other cats. He receives wholesome food and excellent vet care. He can escape the extreme cold in his heated building and enjoy sunny winter days high upon a perch. Keeping more than 100 cats of all sizes and origins warm is a big job! Our electric bill alone can reach more than $4,300 a month during the winter and it takes hundreds of gallons of propane to operate the in-floor heating system in our seven main animal buildings. Won’t you help today? 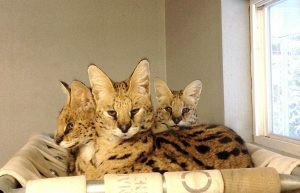 Donations of $100, $50 or even $25 will go a long way to insure each cat at the Sanctuary is provided with heated dens, bedding and temperature-controlled shelters. Your heartwarming gift means warm paws for Shazam – and all the residents at the Sanctuary! P.S. 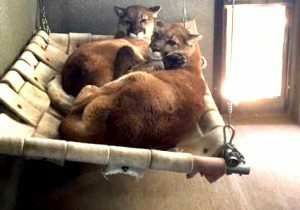 Just $50 a month will provide a comfortable hammock for a wild one at The Sanctuary. Why not make your tax-deductible donation today? 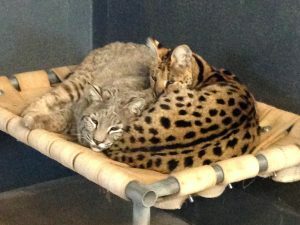 All of our warm weather cats enjoy cozy indoor areas with places to snuggle!